When we approached Word Entertainment about the work we were doing, we were very transparent. Our goals have always been to provide true artist development, amazing music production, and opportunity to Christian artists and songwriters. But the one problem we faced was legitimacy. But we knew that if the right label could see the potential in growing new ministries and the great need for a quality service company to serve these artists and songwriters, we could become partners together in helping ministries grow. From the top down since we began talking with them, Word has been excited about what Creative Soul is doing. “I’ve known Eric for quite awhile, and have seen his continued heart and soul for the working music artist and ministry. At Word, we are always wanting to monitor new trends, sounds, artists, and ministries for what may grow God’s Kingdom. Since we know Creative Soul and the quality they bring to every project, we see this relationship as a way to keep apprised of new talent and original ministries we might be able to be part of.” – Josh Bailey, Sr. Vice President of A&R, Word Entertainment. OK, But What Does it Mean for Creative Soul Artists? Well, it means that every Creative Soul project will be seen by the head of A&R of Word Records once it goes completely through our process and is ready for the world. We’ve even had an artist be invited to the Music Row offices for an initial meeting already. It also means that Creative Soul artists may have the chance to open for Word artists in their area. And we are working on more opportunities that we can offer artists together. Most importantly, the legitimacy of being connected with Word Records cannot be undervalued. At radio, in publicity, in marketing, or just a pastor or fan who sees the Creative Soul logo and the information of our connection to Word Records, one of the giants in the Christian music industry; it’s an association of quality and professionalism. For more information or to get started on a project with Creative Soul, contact us here and we’ll be glad to answer any questions or send you more free information. 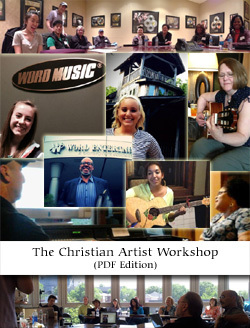 Are you ready to get your music and ministry started? Click here and get things moving! Get Our Workshop eBook now more than half off! Follow Creative Soul via Email! It's a confusing world out there, but you KNOW you have a talent that God has given you. How do you get started? That's what we are all about. Creative Soul specializes in this. Contact us, and let's get started taking your music ministry to the world!